It should be pointed out that many portfolio managers, financial advisors, stockbrokers, and financial planners claim consistent, superior performance but do not provide independently validated evidence of that performance from a firm like Global Investment Performance Standards (GIPS). If returns seem too good to be true ask for a GIPS audit. If they can’t provide a GIPS audit, then be leery! To learn more about GIPS visit their website at gipsstandards.org. Performance can be evaluated in a variety of ways. However, without knowing how a person is measuring his or her own performance, and whether or not that person is doing it properly, it is impossible to know if claims of superior performance are valid. Even the best portfolio managers occasionally have poor years, while the worst portfolio managers occasionally have good years. As major scandals in the financial world have been brought to light, we have seen billions of dollars lost. It is important for you to know what to look out for, what kind of an account and advisor you should have. 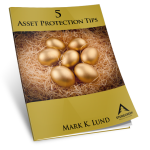 Our complimentary report titled 5 Asset Protections Tips has been prepared to help you in this important part of your financial planning.